Two Joe teams versus two of Cobra's best assassins, and someone is not walking away alive. Costa, Fuso, and Dell'Edera bring us the next chapter of espionage and intrigue in Cobra #16. One of my favorite Marvel ongoing titles is Peter David's X-Factor: populated by a bunch of misfit C-list characters, the book emphasizes evolving characterizations, ensemble casting, intra-personal conflicts, and a heavy dose of humor. It doesn't hurt that X-Factor seems exempt from the too-many crossovers that plague the rest of the mutant titles, and that David is allowed to tell the stories he wants to tell at the pace he wants to set. Reading this issue of Cobra, I'm reminded that Costa seems to be using those same qualities for his own series. Although Flint and Lady Jaye aren't C-list, they've definitely been underutilized in the IDW universe, and Costa's certainly has made them his own. All the characters are likable, even (or especially) the villains. And humor runs rampant throughout the book. This is the best that Cobra has been since before the Cobra Civil War/Cobra Command crossovers. Like he did in the first Cobra/Cobra II series, Costa is slowly building storyline that's both intriguing and satisfying. Like the Joes at the end of the book, we're left with more questions than answers. I can't wait for next month. The summary blurb at the beginning of the comic consistently mentions "the deadly Lady Jaye" every month, although we haven't seen her in action enough to judge if this adjective is justified. This issue will settle that question. 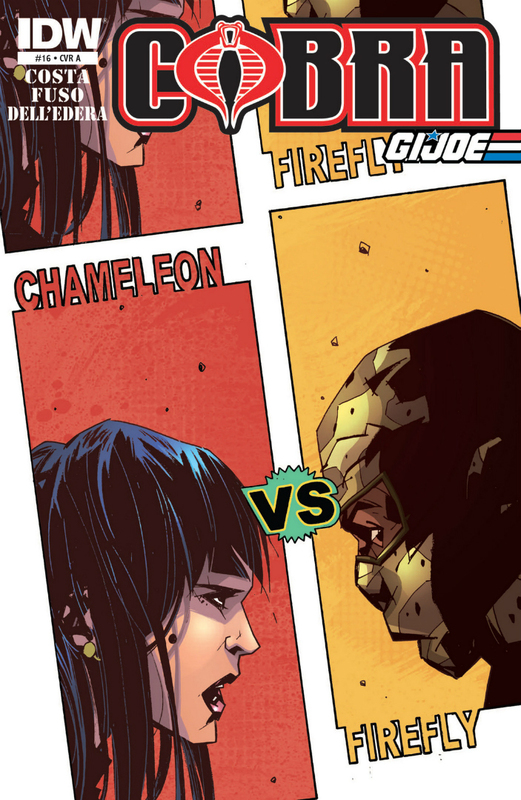 I'm starting to love this Lady Jaye over any previous version (comic or cartoon). At the core, she's Army through and through. And although she hides it well, she seems to be a little uncomfortable out of her natural element, working in covert operations, fraternizing with ex-Cobra agents, and running with sword-wielding ex-Joes. But don't underestimate her, and never force her back against the wall, because you'll see why she's known as "the deadly Lady Jaye." Fuso and Dell'Edera once again do a phenomenal job on this book, giving it a style and atmosphere that carries as much weight as the words printed on the page. My only complaint: please give Flint a better haircut. "I'm shot and tied to a chair!" Once again, Fuso, Dell'Edera, and Costa are bringing us the best Joe book on the shelves this month, and are telling some of the best Joe stores ever. Highest Recommendation.